WHITE PLAINS, NY, September 22, 2016 — The United States Davis Cup Team will host Switzerland in the 2017 Davis Cup by BNP Paribas World Group First Round, February 3-5, at a site to be determined. The International Tennis Federation announced the draw for the 2017 World Group today in London. Switzerland is seeded No. 5, while the United States is unseeded. The U.S. reached the World Group Quarterfinals this year, defeating Australia in Melbourne in March and falling to 2016 Davis Cup finalist Croatia in July in Portland, Ore. The United States holds a 3-1 record over Switzerland in Davis Cup competition. The two countries last met in 2012, in a World Group First Round tie played in Fribourg, Switzerland, where the U.S. team of Mardy Fish, John Isner, Mike Bryan, and Ryan Harrison swept Switzerland, 5-0, with a Swiss team comprising of both Roger Federer and Stan Wawrinka. The United States will host back-to-back Davis Cup and Fed Cup ties next February, as the United States hosts Germany in the Fed Cup by BNP Paribas World Group First Round, February 11-12. With these draws, there is the possibility of hosting both reigning US Open singles champions in the United States for Davis Cup and Fed Cup, as Stan Wawrinka (Switzerland) and Angelique Kerber (Germany) are each their country’s top players, as well as five-time US Open champion Roger Federer. Founded in 1900, Davis Cup is the world’s largest annual international men’s team competition. The U.S. leads all nations with 32 Davis Cup titles. The United States holds a 216-70 all-time Davis Cup record and owns the longest uninterrupted run in the World Group, dating back to 1989. Wilson is the official ball of the U.S. Davis Cup team. For more information, including access to player and historical Davis Cup records, please go to www.usta.com/daviscup or www.daviscup.com. Follow the U.S. Davis Cup Team on Twitter @USDavisCupTeam. For Fed Cup information, visit www.usta.com/fedcup or www.fedcup.com. Follow the U.S. Fed Cup Team on Twitter @USFedCupTeam. A marvelous two weeks in China for Garbine Muguruza was capped off with a 7-5, 6-4 victory over Timea Bacsinszky to claim the Beijing crown. Hampered by an ankle problem in the Wuhan final loss to Venus Williams the previous week, Muguruza was doubtful to even make the tournament let alone win it. The initial goal was to secure her place in Singapore beyond any doubt, which she successfully did against Mirjana Lucic Baroni in round three. Seeing the top seeds fall around her and feeling the ankle was well enough to play on, Muguruza battled on to the final, beating Bethanie Mattek Sands and Agnieszka Radwanska en route. Her opponent, Bacsinszky, had struggled post Wimbledon herself and was looking to rekindle her early season form. Wins over Carla Suarez Navarro, Sara Errani and Ana Ivanovic secured the Swiss’ place in Sundays final. Muguruza had be a thorn in Bacsinszky’s side this season, winning their two previous meetings at the Australian Open and Wimbledon this year. It would provide a fine appetiser for an action packed day of tennis in Beijing with both players exchanging backhands in the opening moments. The Spaniard got off to a fast start with a break, but it was quickly overturned by Bacsinszky who raced to a 5-2 lead. The play was largely erratic with both players suffering physically after battling semi-finals. But Muguruza found that extra gear she needed just in time, overturning the deficit to take the first set 7-5. The Swiss responded with an early break in the second set, but the fifth seed quickly brought it back level. The margins were slim with neither seemingly able to run away with the set. The Wimbledon finalist, however, upped the pressure in the latter stages and earned a break at 4-4 to put herself within one service game of the title. Muguruza had struggled to close out her semi-final against Radwanska after leading 5-1 in the third set, but she had no such trouble this time. A missed backhand by Bacsinszky spelled the end as Muguruza felt to the court in triumph. It was her biggest title yet, and first crown since Hobart in 2014. The biggest win of her career has been topped off by a new career high ranking of four, with potential to finish the year as the world number three. Another big effort from The Swiss has brought her into the world’s top ten for the first time in her career. Remarkable given she turned her back on the game a few years ago. “I want to congratulate Timea of course – Top 10 is an amazing achievement,” Muguruza said. The Spaniard is certainly a player to watch next year. Now amongst the elite, she will be amongst the favourites for Singapore and for the Grand slams next year. Sky is the limit. But for now she will celebrate a week in which she turned 22, secured a place in Singapore, achieved a career high ranking and won her biggest title to date. It was a big week in the doubles too. Martina Hingis and Sania Mirza claimed their eighth title of the year with a three set victory over the Chan Sisters. The world number one doubles team came through 6-7(9), 6-1, 10-8 in a dramatic final. The Chan sisters’ run secured their place in the Year End Championships. They joined the team of Caroline Garcia and Katarina Srebotnik who also confirmed their participation this week. There is only one spot left in the doubles finals. Hingis/Mirza will be there with Lucie Safarova/Bethanie Mattek-Sands, Casey Dellacqua/Yaroslava Shvedova, Elena Vesnina/Ekaterina Makarova, Timea Babos/Kristina Mladenovic, Garcia/Srebotnik and the Chan sisters. Belinda Bencic completed a dream run by defeating Simona Halep to claim the Rogers Cup in Toronto. The 18-year-old, who had already knocked out Caroline Wozniacki, Serena Williams and Ana Ivanovic, triumphed 7-6(5), 6-7(4), 3-0 in the scorching conditions to claim her second career title. Bencic had already made a name for herself as one of the tours brightest prospects, but her status has certainly risen after an incredible week. First Eugenie Bouchard was the victim, then Wozniacki, Sabine Lisicki, Ivanovic and world number one Serena before Halep in Sunday’s final- undoubtedly one of the greatest runs to a Premier title. The Swiss battled with the Romanian for two and a half hour as the pair exchanged tie-break sets. Eventually the heat became too much for the second seed as she was forced to retire due to illness three games in to the final set. “I don’t think I’m so good at speeches yet!” Bencic said post match. 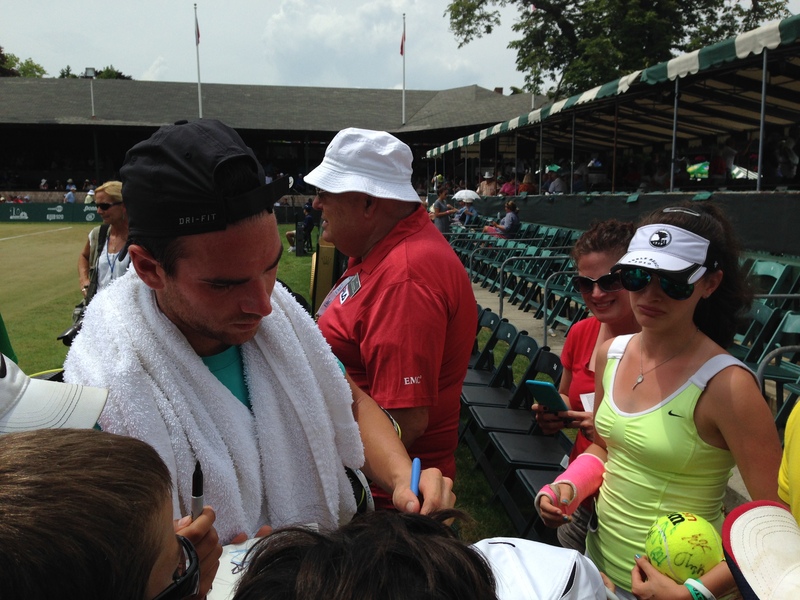 “But first I want to congratulate Simona on a great week, and my mom, my dad and my team. And my fitness coach – I really needed my fitness today! And also Melanie Molitor, my coach – a big thank you to you too. Bencic now has two WTA titles, having won the Eastbourne title in June. This is her first at Premier 5 level, making the 18 year old the first teenager to win a title at this level since Victoria Azarenka in Miami six years ago. To add to the success of winning a title, Bencic will move up to 12 in the world rankings putting her contention for a top 16 seeding for the US Open where she will defend semi-final points. She is also 12th in the race rankings putting herself in contention for the season ending championships in Singapore. Both finalists will head to Cincinnati for the second Premier level event in as many weeks. Halep apologised for being unable to finish the match. “Sorry I couldn’t finish, I fought as hard as I could. Thanks to all the fans for the support” Halep said. The doubles title went to Lucie Safarova and Bethanie Mattek Sands. The third seeded pair have continued their great year by defeating fourth seeds Katerina Srebotnik and Caroline Garcia 6-1, 6-2. Doubles World #8 Kiki Mladenovic paired with Belinda Bencic to win the Citi Open Women’s Doubles title in Washington DC on August 8, 2015. The French/Swiss duo didn’t drop a set all week, as I was reminded. They did get more today than anyone else threw at them all tournament, having given up no more than seven games in each prior match until today’s 7-6, 7-6 win. They had a flight to catch to Toronto, so this is all they gave the press. Mladenovic is #4 on the Road to Singapore WTA Year End Championships. This is the 12th WTA doubles title for Mladenovic, who won the 2013 French Open mixed doubles title. For Bencic, it was her 2nd doubles title and her first trip to Washington. She won her first singles title this summer in Eastbourne. It was all fun and games for Team BelaKiki/KikiBela, but it’s back to serious dubs business for Mladenovic and her regular partner, Timea Babos. 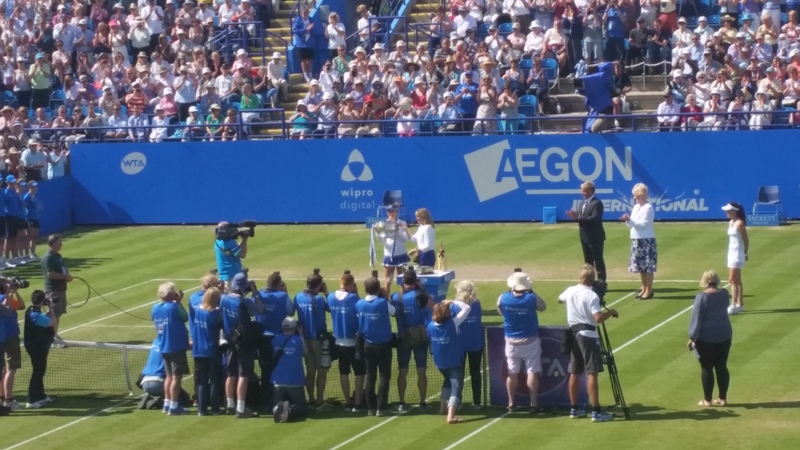 Bencic won her maiden WTA title with a 6-4 4-6 6-0 win over Poland’s Agnieszka Radwanska at the Aegon International in Eastbourne. The 18-year-old Swiss, who had reached the final in s’Hertogenbosch earlier this month, regrouped after dropping the second set and coasted through the decider as her opponent faded. It capped off a superb week for Bencic, who overcame defending champion Madison Keys, British hopeful Johanna Konta, as well as Eugenie Bouchard and Caroline Wozniacki after they had to withdraw. She said: “I was very focused and I played very free. I was disappointed I didn’t close out the second set and I was starting to get tired but then I started (the third set) very focused. I (got to) 3-0, so after than I relaxed a little bit and could close it out. On a windy day on the south coast of England, the opening six games of the first set went with serve before Bencic was able to forge out a break in the seventh, only to relinquish it in the following game. However, Radwanska could not press on and dropped serve again in the ninth – after initially saving two break points – and Bencic wrapped up the set in the following game, converting on her second set point. A more focussed Radwanska started the second brightly, coming to the net more often and finding more winners as she leapt into a 3-0 lead, but Bencic broke back after a lengthy fifth game. A hard fought contest reached its peak in the latter half of the set as five consecutive games went to at least deuce, yet each player managed to hold serve until late on. Eventually, the Swiss was broken in the 10th game to hand Radwanska the set, shortly after she failed to capitalise on a break point, which would have allowed her to serve for the title. The Pole looked to have seized the initiative after fighting to level up the battle and her 14 titles to Bencic’s none suggested it would be hers for the taking. However, as in her semi-final in Nottingham against Monica Niculescu, Radwanska’s challenge faded dramatically in the deciding set while her adversary produced her most consistent tennis of the final. The ninth seed could only stave off one of the four break opportunities afforded to Bencic in the third set as the youngster surged clear, losing just 10 points in the entire set on her way to sealing the victory in the most comfortable fashion. The Premier win moves Bencic up to a career-high ranking of 24 and will leave her brimming with confidence ahead of Wimbledon which begins in earnest on Monday. Radwanska’s first appearance in a final in 2015 sees her advance two spots in the rankings to 11th, and signals her as a dark horse for the grass court slam despite her defeat at Devonshire Park. Bencic will arrive at Wimbledon as the 30th seed and will clash with Tsvetana Pironkova in the first round – who fell in the Eastbourne quarter-finals to Radwanska – and she is projected to meet Serbia’s Ana Ivanovic in the third round. Radwanska, meanwhile, begins her quest for a maiden grand slam against Lucie Hradecka, and could face defending champion Petra Kvitova – who is without any competitive tennis on grass this year – in the last 16. Caroline Garcia and Katarina Srebotnik won their first doubles title as a pair, defeating the Asian team of Yung-jan Chan and Jie Zheng 7-6(5) 6-2. Garcia/Srebotnik will enter Wimbledon as the 10th seeds and are scheduled to play Tereza Smitkova/Xu Yifan in the first round.